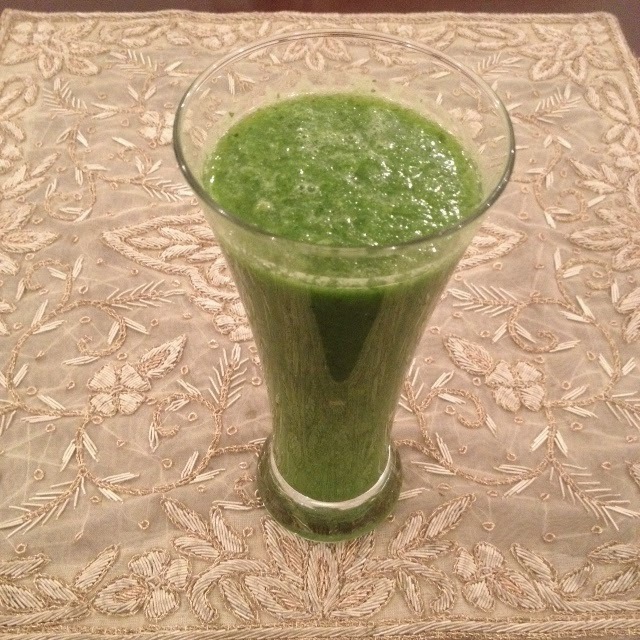 Today I would like you to be a part of my healthy lifestyle journey by sharing with you my first ever healthy recipe.Using this super detoc green juice I lost 1 pound in just 3 days, and 2 in a week! In the past I’ve shared recipes of my baking adventures as I have a bit of sweet tooth, I loved to bake and gorge on desserts much like a Cookie Monster- I kid you not. But this year after seeing myself in photos from our holiday in Dubai, I had the painful realisation that all my jeans/tops didn’t conspiratorially shrink in the wash. I was appalled at the saddlebags, pouch, and bat wings that seemed to make a trolling appearance in every pic. (Incidentally, my analogue weighing machine was kind enough to lie to me..its quite old..and weighing myself on a shiny new electronic one gave me a nasty shock. That led to the discovery of the Jillian Michael’s 30 day shred which did absolute wonders for both weight loss and overall fitness level. In order to maintain my new weight (and maybe lose an extra few lbs), I started doing a lot of research on nutrition, food deficiencies and much more. I have struggled with staying healthy, feeling bad about not doing enough or being as motivated to stick to a program to see results. Sometimes I blamed hormones for my sugar cravings, or social occasions such as Eid, where healthy food is scarce. I know some friends who say that its their genetics, their mom was the same after she had kids. Other times I find it too difficult or expensive to follow fancy diets with hard to source ingredients or ones that leave a substantial dent in your wallet. The truth is you can lose weight (with exercise more on that in other posts) and healthy diet which is easy delicious and healthy without breaking the bank. There is no need to waste time feeling guilty.I I will tell you the things I wish I had known earlier. I will tell you exactly what to and how to do it. All the recipes that I post have been tried and tested and tweaked by myself and contain ingredients that are easily available. Similarly, there is no need to go out and buy fancy equipment, if you have juicer already great, if not, a blender will do just fine. You don’t need to be a Masterchef, or spend hours slaving in the kitchen to make my recipes. Today I am going to share one of my recipes that helped me lose 1 pound in only 3 days. It also reduced the size of my belly bulge by a whole inch by getting rid of the stubborn belly bloating. If you haven’t signed up for my email list yet, sign up immediately so that you won’t miss my healthy tips and recipes in the future – they will come straight in your inbox. Oh and do stay in touch on Facebook, Instagram and Twitter. Place all items in blender in the order above, ( the important thing being water is poured in first in order get things moving). Blend until it forms a green smoothie like mixture. If you like your juice with pulp pour into glasses and stir and drink slowly swishing it around your mouth to activate digestive enzymes and really absorb the nutrient value from the green goodness. –However if you like it smooth strain through a fine sieve, press the pulp with spoon to get the maximum juice out of it. *Optional Add a tablespoon of ground flax seed and ground almonds to add some protein power and nutty flavour to the green juice. Consume immediately or store in an airtight container in the fridge for up to 24 hours. Drink on an empty stomach for best results. I personally like it with pulp as I don’t want to lose the benefit of all that fibre in the pulp which can help you stay regular and also give you a feeling fullness which helps you fight those midnight hunger pangs. Fibre also absorbs fat in your diet flushing it clean away from your system. If you are using this as an aid to weight loss then I suggest drinking the green juice with pulp and as a meal replacement. Breakfast was PB sandwich (brown bread) and my cant live without glass of buttermilk/laban/Activia. I lost a pound in 3 days, I felt ‘lighter’ and it had a cooling, refreshing effect on me. After 3 days were over I continued using the green juice it as supplement to my diet rather than as a meal replacement. Excellent source of Vit K, Potassium, iron and Vit C, the nutrients will leave your body more energised, more PH balanced and more healthy. Brighter clearer and healthier looking skin- now who doesn’t want that?